Use a countdown component to create a sense of urgency. To select a countdown element, the Selection Tool must be set to "Auto" or "Element". You can edit a selected countdown in the Right Pane of the Page Editor. Countdown Theme - choose from two countdown themes: Standard (default), or Outlined. 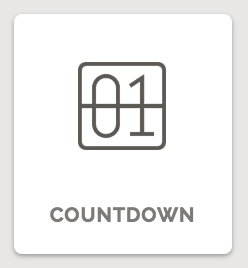 A newly added countdown component will share this theme. Uncheck "Use Shared Theme" to make a countdown's theme unique. Countdown Type - you can either set a countdown to start by counting down to a future date ("Future Date") or count down from a specific amount of time ("Fixed Time"). Date - choose the date of your event here. Time - the time on the date to count down to. Blocks & Labels - set the color and opacity for a countdown's blocks and labels. Numbers - set the color and opacity for a countdown's numbers. Style & Size - there are three countdown border style options: borders, borders and strike-throughs, or no borders. For size, a countdown can be small, medium, or large.